The wheel has turned full circle for golf on the Costa del Sol. Forty years after Robert Trent Jones Senior built the first two courses at Sotogrande to kick-start European golf tourism, the scion of another US architectural dynasty has created a comparable masterpiece at the adjacent San Roque Club. Comparable is an apposite adverb. While the architectural style and terrain are only vaguely similar, Perry Dye’s creation has elevated the stylish San Roque into the exclusive echelons of European golf courses of which neighbouring Valderrama is the flagship. Known as the New course, it perfectly compliments the David Thomas layout that transformed the site back in the 1980s and which put San Roque onto the world stage of golf. Both Trent Jones and David Thomas had expansive sites on which to practice their arts. In this case, Perry Dye, son of the illustrious Pete, found a limited canvas at odds with the magnanimous acreage to which most US golf architects are accustomed. The New course is laid over a scant 45 hectares, a vaguely triangular-shaped oblong lying parallel to the ocean and with a sacrosanct nature reserve running along one boundary. To complicate matters, its centrepiece was a huge hill festooned with cork and oak trees. Plainly, “shifting dirt,” as the Dye dynasty has it, was a priority, as was transplanting trees, hundreds of them. Because of a wet winter, two years were to pass before the first ball was struck, in September 2003. The consensus: San Roque New may be one of the finest new courses in Europe and certainly one of the most beautiful. Visually it is a joy; technically it is a masterpiece of the art, fun for beginners and a thorough test for those capable of strutting the back tees. Because of the shape of the site most of the holes run east to west, or the reverse, so the prevailing winds, from the mountains or the sea, are generally across the line of shot. The exceptions are holes 4, 5, 6, and 13 that lie at right angles at one end of the site. There are sea views from 12 holes, often over a carpet of waving treetops. You’ll gather it is not displeasing to the eye. Illusion, the architect’s accomplice, is rampant. Stand on most tees and the knuckles will turn white. But a treat, not a trick, lies in wait: the course is much easier than at first it appears. The fairways look narrow but frequently they widen out beyond a mound, or a sand dune that gives a links appearance in places. In the Dye tradition, all the bunkers are visible. Some are strategic, some are penal; some purely aesthetic, some are traditional pot bunkers and some are monstrous. The latter are US-style waste bunkers that, as at the short 8th, stretch the length of the fairway or, as at the 7th and the 9th, act as buffers on the edge of a lake that guards each green. San Roque New is an all-round examination of ability and character where the major test invariably awaits with the approach shot. This is because the greens, though large, present small targets in that they have a narrow opening or are angled, often side-on and partially hidden by subtle mounding. The lay-up will be a popular option here. Horticulturally speaking, the New course is unique in several aspects. In what he classifies as his wilderness areas, the architect has introduced a species the Americans know as love grass. Similar to marram grass but finer stemmed and lusher, it lays a knee-high carpet that gives a “Mexican wave” in a breeze. It forms a beautiful backdrop to many holes, along with another innovation: cascading wild flowers, acres of them, whose seeds were brought over from their native Colorado, where Dye is based. The more practical grasses are unusual, too. Dye has used five varieties of hybrid Bermuda on each hole: tees, fairways, green surrounds and on the putting surfaces. On the greens it is Tifeagle, a species ideally suited to the climate of Southern Spain. It is one that doesn’t hibernate in winter. It gives a good matt cover and has a finer grain, too, bringing a more consistent roll than the old fashioned Bermuda. Good putters will be licking their lips, although they’d better be sharp-eyed. The greens get a tad slick down-grain and consequently more than a hint slower against it. On cross-grain putts the ball will wander just a touch at the death so bring your reading glasses! A compelling vista is enhanced by a series of rock retaining walls, built from material unearthed in the construction, and two large lakes. The latter provide irrigation and add spice to four holes: the 7th and 14th greens straddle one lake; the 9th and 18th are separated by the other. The New Course is simply a celebration of golf in its purest form. We commend it to all who love the game. Technically, this place is a triumph of design and construction, in that the architect and JCB drivers have managed to sculpt a long and testing course in such a small piece of land. However, the end result doesn’t add up to the sum of its parts. The course feels artificial, is dominated by cart paths which are frequently in play, and many of the holes seem to merge into one as the same design features have been copied and pasted. On some holes I stepped on to the tee and found myself thinking: “haven’t we played this hole already?”It’s not a bad layout, I'm giving it 4 balls, but there are a lot of much better courses in the area, and it doesn’t come anywhere near to my top 20 in Spain. The course maintenance could have been better but it could be excused by heavy rains in the preceding week. The accommodation at The Suites might have been 5-star in 1997 but now could be given 2 stars at most. Our room smelled of stale tobacco, the plaster was peeling off in places and the entire resort was in need of urgent repairs. I can recommend the nearby restaurant Bucintoro located in the San Roque Club Commercial Center. Better than its older brother, San Roque New has been a nice surprise. Very enjoyable course with many challenging holes and with different difficulties. Water comes into play in several delicate holes while in others fairways are quite tiny. Unfortunately when we played (September 2014) maintenance was not so great and the course seemed a little "abandoned", which is not acceptable given the price paid. Played this a few times over the last 5 yrs and never been disappointed. Venue, setting etc.... are all fantastic as you'd expect on the Sotogrande estate and clubhouse very unusual inside. Course always in great condition, even for Spain these greens are slick .... they are as quick as they look ! its good value for the price .... only downside is that it is perhaps a little too squeezed into a small plot of land and hence can at times feel a little too manufactured and manmade. Although I had already played her famous neighbours Old, Valderrama, Finca Cortesin and Real Sotogrande, I thought that for my job as a Tour Operator I needed to play and test New to see what it can offer. And believe what I found is really good, a very fun course to play with good par 5s, a couple of drivable par 4s and the set of par 3s asks you for different shots to very challenging greens. Designers cannot be blamed when the piece of land is not that good and this may be the case, as some fairways stretch too narrow and the elevation changes in a couple of holes are too much and sometimes unfair, but I believe Mr Perry Dye did a great job and the course in its own is really worth to be played, and if you can more than once. And what was better in my experience is that as course is set for a Pro Tournament, the greens were rolling very fast and true, even better than Valderrama. Hole 12, a drivable par 4 gives a great example of a risk-reward shot, it can be done but if missed God help you! Holes 9, 15 and 18, three very tough par 4s with water in play for the approach shot are maybe the best holes on the course. 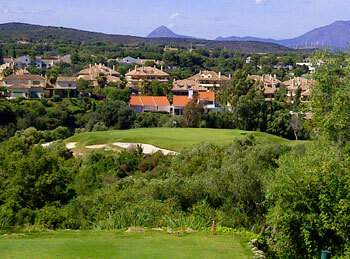 And at last, if you are by The Costa del Golf (Sol), get a ride and come and play San Roque New, you wont be dissapointed! My friend and I have played San Roque (New Course) each of the past three summers; it is undoubtedly one of our favourites on the Costa del Sol and we have played almost 30 courses in this area as well as a couple near Cadiz. There is loads of variety – unlike some other courses whose principal defences are ponds and lakes or which are carved out of deep valleys/hillsides with fairways bounded by lateral water hazards. Although we normally like to play our holiday golf off the white tees, we find San Roque (New) to be more challenging off the yellows – the bunkers are in range and it means that a little more thought is required to avoid some of the excellent bunkering. The greens are excellent – extremely fast down grain and down wind (and there was plenty of that last week) and with subtle borrows which often become apparent only after you have putted! Favourite holes would include the superb par-3 4th, the par-5 7th, and the holes which finish both halves of the course – although the three holes which I birdied last week have now risen up the favourites list! The only thing which stops this getting the maximum score is the clubhouse/bar terrace – nice enough but there are nicer ones on the coast which offer superb views over the course and the surrounding area (e.g. Almenara just up the hill). However, there is no doubt we will return each year that we are visiting this area – a great course and a super test of golf. I clearly played a different golf course to that so glowingly described in the introduction. "Technically it is a masterpiece of the art" - translation - a lot of soil was shaped and a lot of money spent. This is somewhat contradicted by being "a celebration of golf in its purest form" - translation - a terrain which naturally lends itself to a golf course leaving the designer the task of levelling land for tees, shaping greens and siting bunkering. This is a decent enough course, worth playing, but certainly not top 20 in Spain. In the immediate general area La Cala, Mijas, Los Naranjos, Rio Real and Santana are superior. Another average course pushed up the rankings. Played both courses at La Cala and Mijas along with Santana and IMO San Roque New is by some distance the best course... are you sure you didn't play San Roque Old? Having a differing opinion is not an indication that I was unaware of which course I played, the quotations from the effusive introduction proved this. The reference to the Old course is puzzling as it has consistently received higher ratings from reviewers, whereas I am not alone in having reservations with the qualities of the New. For brevity, only comparative courses in the general area were named. Unranked courses such as Girona, La Envia, Las Ramblas and Playa Serena are as good as, if not better than, San Roque New. Hopefully, a future reranking will see the New move down the list to a more realistic position. I have played thirty plus courses in Spain and San Roque New would not make my personal top ten. On a related point, reviewers do seem to award the six ball rating far too readily. Of course opinion depends on when the said person played the course and the conditions at the time many courses change with season and maintenance through the year. As someone who resides here permanantly and who plays all the courses mentioned with many other local golfers at many different times though the year i cannot see how Santana, Mijas or a holiday course like La Cala can be anywhere near the league of San Roque New in fact I know they are not. Maybe if you had mentioned Las Brisas Sotogrande La Reserva Finca Cortesin. My view is that the New course is a beautifully designed and maintained course and for winter play its possibly the best on the coast. We played this course last saturday and it is in SUPERB condition. Way better then La Reserva, Old course and Alcaidesa which we played as well. Good value for the combo but New is the course to play at the moment. A nice course, but not a great course. We played it in October 2011 when it was in perfect condition, but lovely fairways and greens do not make up for the fact that the layout feels very artificial and is crammed in to the land available. I found a number of the holes a bit gimmicky, with features thrown in for the sake of it rather than to enhance the challenge of the holes. The cart paths as well are very prominent and frequently seemed to be in play. I can only assume the high rating is down to the San Roque name. This is nowhere near my top 10 in Spain.